Appliance Repair Tips: Is Your Dryer a Fire Hazard? 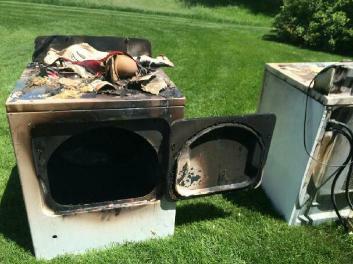 Appliance service pros talk dryer fires. You probably don’t think of your dryer as a dangerous appliance, and it’s not when you properly maintain it. However, neglecting to clean your dryer on a regular basis can turn it into a serious fire hazard and result in needed appliance repair. Over time, the dryer hose and vent duct can become clogged with lint and other debris, meaning your dryer’s air flow becomes restricted. That restriction can cause your appliance to overheat, which can ultimately lead to a fire. Luckily, a thorough vent cleaning can stop your dryer from becoming a threat to your household. If your dryer is plagued with any of the symptoms listed below, turn it off immediately, and either clean the dryer and vent on your own, or call a dryer repair professional to do it for you. If your dryer is running and you smell something burning, turn off your appliance right away. A build-up of lint somewhere in the machine has most likely ignited due to your dryer overheating. Lint is extremely flammable, which is why you should always clean your dryer’s lint trap after every use. If you fail to do so, the trap won’t be able to stop lint from entering the dryer’s cabinet or the vent duct. Damp clothing at the end of a regular dry cycle can indicate a clogged vent. Increased drying times suggest the hot, moist air your dryer is supposed to push out is trapped due to a blockage, meaning your clothing will take much longer to dry. A clogged vent isn’t just a fire hazard, it also decreases your dryer’s efficiency and puts more strain on the machine, which can significantly shorten its life expectancy. Cleaning your dryer’s vent will eliminate the risk of a fire and return drying times to normal. If the top of your dryer feels hotter than usual, a clogged exhaust vent is a likely culprit. The restricted air flow will cause the temperature inside your appliance to exceed its normal level, which can lead to the top of your dryer feeling hot to the touch. You may also notice the clothing coming out of your dryer feels hotter than normal. Both occurrences signal your dryer is overheating and needs a thorough vent cleaning. Although a blocked vent is one of the leading causes of dryer fires, it isn’t the only hazard that poses a serious fire risk. To make your dryer completely safe, keep the following threats in mind. You should think twice before overloading your dryer. From excessive lint to clothing restricting air flow an overloaded dryer is a definite fire hazard. If you haven’t already read your dryer’s manual, do so to learn the load restrictions of your appliance. Keep the area around your dryer clean and clutter free. Sweep the dust and lint from the back and sides of your appliance, and never store combustible items near your dryer. If your dryer still has a plastic or foil accordion-like duct, you will want to replace it immediately with a rigid, non-ribbed metal duct. Plastic and foil ducts tend to collect lint and can become crushed due to their flexible nature, which can drastically restrict air flow. Items containing foam, plastic, or rubber should not be placed in your dryer. Don’t leave your dryer running when you leave your home. If a malfunction occurs and nobody is home, a small issue can quickly turn into a major disaster. When maintained properly, your dryer is a safe appliance that shouldn’t give you many issues. Unfortunately, busy schedules can often make it hard to perform cleaning tasks, such as, removing lint from your dryer’s vent duct. If you don’t have the time to properly clean your dryer or you are concerned your appliance is malfunctioning, please contact us today for local appliance repair and we’ll be happy to help you and your appliance.